Leaving the White House is “sleeper cell” Barack Hussein Obama, an enemy of liberty, a serial liar and someone who meticulously followed a Soviet-style plan of subversion to systematically destroy America. Let’s hope Trump initiates criminal investigations into at least some of the anti-American hucksters and mafia bosses who ran his regime (Lois Lerner, Loretta Lynch, Eric Holder, etc). Over the last eight years, Obama has systematically assaulted America’s economy, culture, liberties and international reputation. He has deliberately aided America’s enemies (like Iran) while stiffing allies in the Middle East (like Israel). His political decisions, both domestic and international, have been designed from the start to weaken and disrupt the United States of America while empowering America’s enemies, both domestically and overseas. Economically, Obama is the worst President in American history. 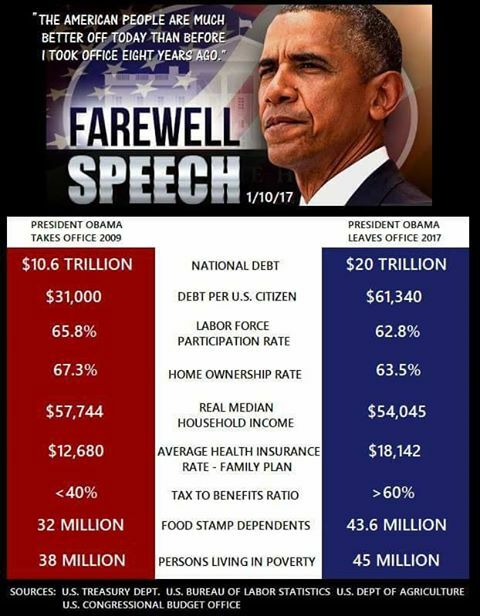 The net effect of his failed Marxist/communist economic policies, Obama comes in in 4th place as the absolute worst president in American history with regard to GDP growth at a miserable 1.457%. But over his two terms, the amount of debt has doubled once again, and now sits at a mind-boggling $20 trillion. Should the United States find itself in a real shooting war with a great power, it will be difficult to purchase war materiel because of this massive debt. – Terrorism: Obama’s refugee resettlement program — where he’s accelerating the pace at which people from terrorist-breeding parts of the world like the war-torn Middle East are being allowed into our country — is putting more Americans at risk. Islamic extremism is on the rise and carrying out active operations inside the USA. Allowing people from those parts of the world into the U.S. without proper vetting and background checks is dangerous and destabilizing. – Iran: The Islamic republic of Iran has been an enemy of the U.S. for decades. But Obama has seen to it that Iran was not only put on the path to develop nuclear weapons, it was also rewarded with billions in illegally laundered cash delivered on a military cargo plane. Yes, international money laundering is “business as usual” under the criminal Obama regime. – U.S. Navy harassment: One of the ways the United States helps maintain global security and order is through the deployment of its powerful Navy. But over the course of Obama’s two terms, the reputation of U.S. military in general (and the Navy in particular) has taken it on the chin. China: The People’s Liberation Army Navy has been allowed to build artificial islands in the South China Sea, while Beijing now claims all of that massive body of water as its own. This has dire implications for the future in terms of allowing Beijing to control a multi-trillion dollar-per-year shipping lane vital to the U.S. and its Asian allies. – Russia: The White House, through the hapless “diplomacy” of a politically compromised and wholly inept State Department led by Hillary Clinton, actively sought to provoke war with Russia while surrendering U.S. strategic resources to Russian-linked corporatists (uranium mining companies in particular). When you consider what Russia actually got out of these deals, you can see it was all rooted in corruption, not any attempt to promote America’s interests. Clinton got some cash for her foundation and Russia got 20 percent of all strategic U.S. uranium reserves, guaranteeing Moscow control over most of the world’s primary nuclear weapons-producing ore.
– China rising: At the risk of losing influence throughout Asia, the Obama administration claimed it was “pivoting” to the region to counter a more aggressive China. But that was a lie. In reality, the Obama foreign policy team, at the president’s behest, allowed Beijing to expand its influence over traditional U.S. allies and the entire Asian region. While the law should not dictate how people live or who they can love, the strength of the family unit is what teaches children that the people are what achieve abundance and advances for nations, not the government. Under Obama, the destruction of the family went hand in hand with the rise of the “nanny state” (police state) government that tried to function as Big Brother. – Unlimited immigration: Obama’s senseless ‘open borders’ policies — rooted in changes he made to immigration law via executive order, which he said dozens of times he could not do — are systematically changing the face of America, which is manifesting itself in more racial and ethnic division rather than unity. – Cyber security is a shambles: The world’s great powers — and even rising regional powers — have dramatically honed their cyberwar and hacking skills during Obama’s tenure, yet the president a) did little to develop better defenses against cyber assaults; and b) did next to nothing to punish countries (like China) who were serial hackers (other than craft some worthless ‘agreement’ that the Chinese repeatedly broke). On top of all this, Obama chronically lied about unemployment figures, oversaw Eric Holder’s criminal gun-running operation called “Fast and Furious” and directed Lois Lerner to weaponize the IRS against Tea Party non-profits… all while dropping tens of thousands of bombs on foreign countries as a “Nobel Peace Prize” winner. Good riddance, Obama! Your goal to achieve the complete destruction of America has failed. 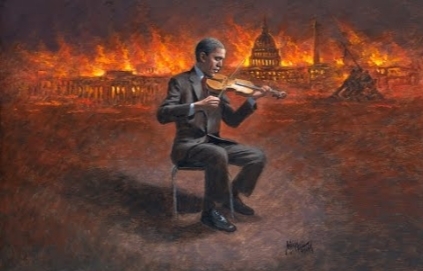 We the People rescued it just in time, and now we have a true patriot in the White House who is already working to overturn your eight years of systematic economic and cultural destruction. No wonder the unhinged left-wing media is desperately trying to destroy Trump… they hate America just as Obama did. Sooner or later, by the way, America’s true patriots are going to have to defeat the communists who have infiltrated government, media, academia and the public education system across America. I get the sense that a new civil war is still brewing, and that the radical commies on the left cannot be reasoned with, bargained with or negotiated with. They will sooner or later have to be utterly defeated once and for all by the legitimate patriots who defend the Republic against its enemies, both foreign and domestic.